It is a clear fact that every business entity is operating in the market to earn a profit. Profit making is the major objective of every business firm and this can be achieved only when a company is highly efficient. Effective and optimum utilization of company’s funds and capital leads to greater efficiency which ultimately leads to higher profitability. It is also important for business firms to benchmark their performance against the competitors in the market. Therefore, it becomes necessary for a business firm to have a financial tool that can act as a base for its performance measurement on a yearly basis. This is where the return on capital employed i.e. ROCE helps companies to measure their business performance and efficiency. ROCE also allows comparison of a company with the other companies within the same sector/industry. 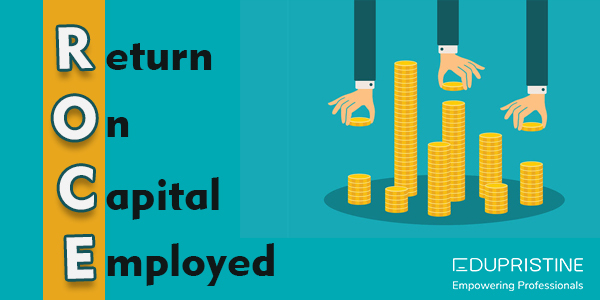 This article will help you in gaining an insight into return on capital employed & the importance of return on capital employed and its various aspects that may help you in calculating business profit against the capital employed. Let’s start with the definition of ROCE first. Return on Capital Employed (ROCE) is a profitability ratio that helps to measure the profit or return that a company earns from the capital employed, which is usually expressed in the terms of percentage. It is used to determine the profitability and efficiency of the capital investment of a business entity. It is simply defined as a financial ratio that helps to determine the capital efficiency and effectiveness of business. It is the profit that a company earns from its business operations before the deduction of taxes and interests. Therefore, it is also known as earnings before interest and taxes (EBIT). It is calculated by deducting operating expenses and cost of goods sold from revenues. It is the total amount of capital invested in the business operations by the shareholders and other sources to earn a profit. It is also known as fund employed. Capital employed is the sum of the equity of shareholders, all the debt liabilities, and all the long-term finance. Return on equity is another financial ratio used to calculate profit and people often get confused between these two ratios. ROCE is considered better than the Return on Equity as ROCE is helpful in evaluating company’s longevity and durability. ROCE is also considered more beneficial as only the percentage return of equity shareholders is calculated in Return on Equity (ROE) whereas in ROCE, the return percentage of all the shareholders/ capital providers is calculated. Return on capital employed of a company should be higher than its cost of capital in order to remain in the market for a long run and only then it will be considered as a good return on capital employed. Higher will be the ROCE of a company greater will be the efficiency. How is Return on Capital Employed calculated? ROCE is calculated by using a simple formula. Various financial statements like Balance Sheets, Profit/Loss account are used to calculate ROCE. As it is a profitability ratio, it is calculated by dividing net operating profit of the company with the employed capital. Apart from this ROCE can also be calculated with the help of return on capital employed calculators available on the internet. You just have to enter your values and you will get desired output without doing calculations manually. Return on Capital Employed Ratio exactly shows the profit generated by each unit of capital employed. It is important because it is used to measure the financial performance of a business. It has built a strong position as a financial tool to be used for evaluation in highly capital-intensive sectors like telecommunication, infrastructure engineering, oil and gas companies, power utilities etc. The higher rate of ROCE indicates how effectively a company is utilizing its funds. Before calculating the return on capital employed a level business strategy is necessary to be framed to check the applicability of ROCE in a particular business as ROCE varies from industry to industry. Industries these days are aware of the advantages of Return on capital employed. Most of the industries, especially highly capital-intensive industries, use this financial tool to achieve maximum profitability from the capital employed. Return on Capital Employed focuses on profit. Facilitates improved company’s balance sheet management and profitability. Helps managers gain knowledge about the effective utilization of capital. Used for performance measurement of the company and helps investors in making investment decisions. Facilitates comparison of profitability of two companies of same sectors. Useful in evaluating the growth forecast of a company. Companies with high return on capital employed industry average can be spotted with the help of Return on Capital Employed. Besides the advantages, ROCE also has few drawbacks. One of the major limitations of return on capital employed is that the returns are measured in the book value of assets, which only favours the older companies. Sometimes the ambiguous and debatable nature of ROCE also makes investors think twice. ROCE is calculated on historical data and this again serves as a drawback of ROCE. Companies with higher ROCE and greater efficiency are favoured by investors because such companies tend to be more stable compared to the companies with low ROCE. We have learned the importance of return on capital employed and every Industry should consider ROCE as a powerful tool to get higher returns, therefore, it must be given attention. Hence, we can say that calculating your profits with the return on capital employed can bring more stability and efficiency to your business.